Ronald Sapa Tlau, the lone Rajya Sabha MP from Mizoram on Monday said plans are being made so that each district has its own FCI godown for easy distribution of foodgrains across the state. At a press conference held at Aijal Club in Aizawl Ronald Sapa Tlau said that due to connectivity issues and heavy monsoon in Mizoram, food grains stock point or godowns are of prime importance. “The largest FCI godown we have at the moment is Tanhril godown which has the capacity to store 5000 MT of rice and other supplies. We have made plans to set up a new building at Sairang Dinthar which will have the capacity of 10,000 MT. FCI has already okayed to build this new construction. DPRs and other logistics will be worked out by the Central PWD and we hope that work will commence soon,” Ronald said. The Rajya Sabha MP further said the terrain and the climatology of Mizoram especially during monsoon has made it almost impossible for big trucks to carry supply to the remote districts of Mizoram and said that the FCI has already arranged a proper calendar. 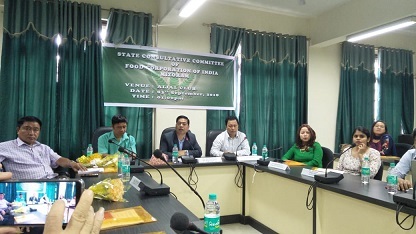 He said that during the ongoing State Consultative Meeting of FCI and stakeholders all have agreed in principle that godowns be constructed in all districts of Mizoram. “Our first priority is Champhai district, which is the hilliest district among all the districts of Mizoram. Bigger trucks cannot ply the hilly curves so the district is in need of a stockpoint, we have agreed that a new godown be constructed at Kawlkulh. The southern district of Siaha still doesn’t have an FCI godown. With the cooperation of the state civil supply department, a new godown will be built,” he added. Ronald also said that FCI workers and Mizoram officials at Food Civil Supplies and Consumer Affairs department have been working hand in hand to ensure that people living even in the remotest part of the state get their equal share. “Storage loss, which is one of the biggest problems faced in the country, is almost null in Mizoram, last statistics of storage loss in Mizoram is well below the national cut off percentage of .11 per cent,” the MP added.